Header actions page navigation provides the ability to add a menu to the segment header that simply offers navigation to child pages within the same Page Series. If this option is used then the "Header has Actions" checkbox in the Header Tab needs to be checked to show the header menu that contains these actions. Grid Row drill-down (child) page navigation provides the ability to add a menu to each grid row that simply offers navigation to child pages within the same Page Series. The menu captions are defined (e.g. 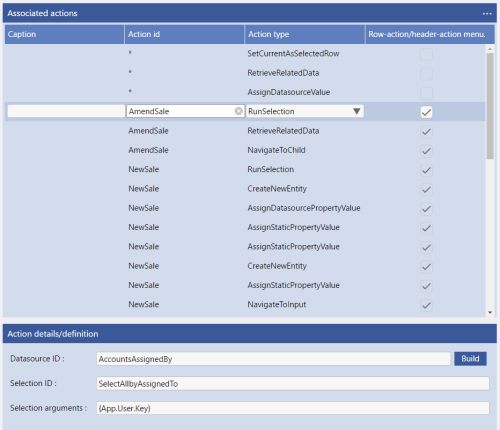 Account Details in the example on the right) and appear in a separate menu to the grid row actions menu (see below). This can be very useful when used in conjunction with Adaptations. In the example shown, see images below, the "click navigation" (Grid row drill-down child navigation) is disabled by an adaptation when the page is loaded as there are three segments at the bottom of the screen that hold the data for accounts and contacts. When the height of the screen is 640px or less the additional navigation menu is displayed (see second image) as the three segments at the bottom of the page are hidden due to a lack of screen real estate. Grid Row Actions provide the opportunity to hook into the Evoke Click Actions from menu options in the ellipsis at the end of each grid row. 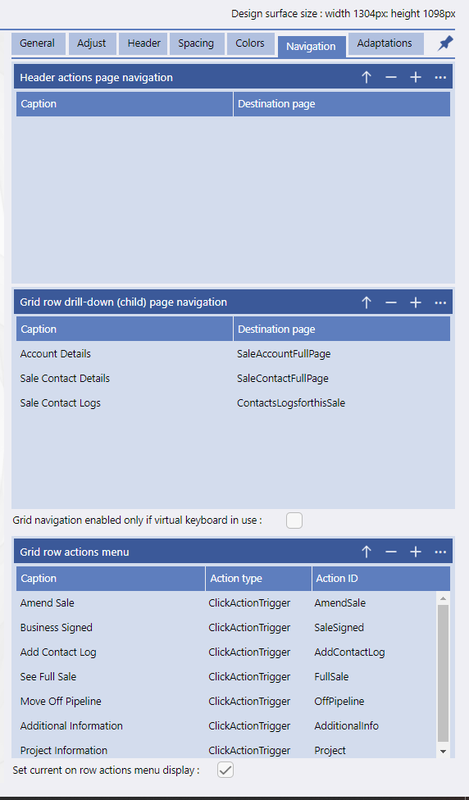 in the example on the right (above), navigation options such as "Amend Sale" provide a menu option and then, when clicked, invoke the click actions associated with this. You can have as many grid grow navigation options as you wish and each can invoke different click actions. 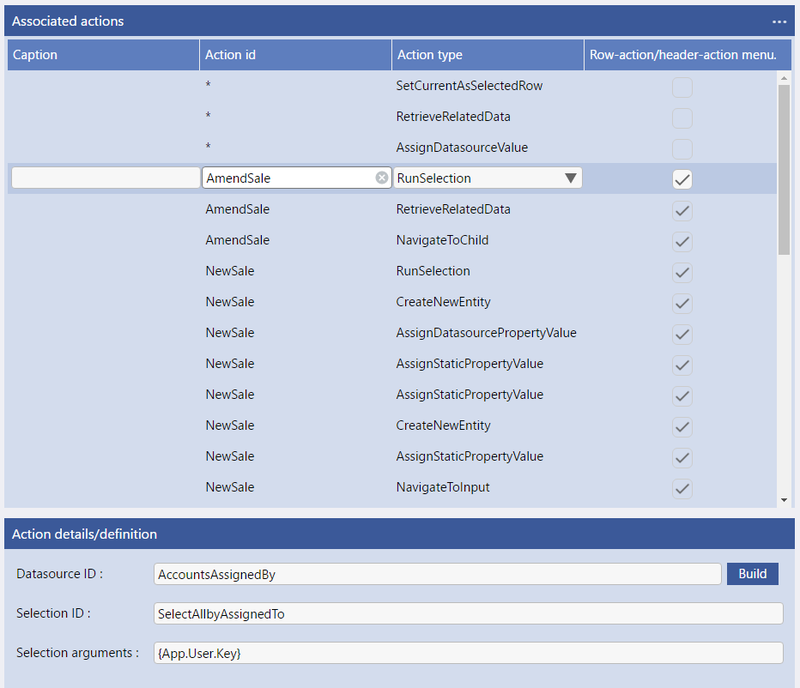 The Click actions, in the example given, that have an action id of "*" instead of the Action ID listed in the grid row actions, relate to ALL action id's. Therefore, in the example given the action "Set Current as Selected Row" is also actioned. An example of the grid row and associate action from the completed app appears below.